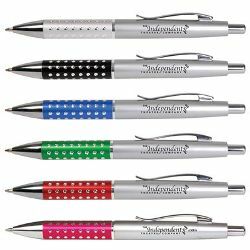 Push button ballpoint pen with metal clip. Jumbo refill. Item size (mm) 139L x 11Dia. Print Area (mm) 50L x 8H. Colour Available: Silver/Red, Silver/Blue, Silver/Black, Silver/Clear, Silver/Green, Silver/Pink.